Emily runs through a puddle wearing her Salomon Sonic RA running shoes and Darn Tough Socks, while training for the Vermont City Marathon. Photo credit: Zach Walbridge. 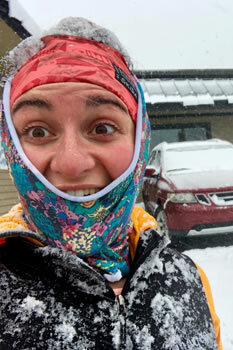 Emily staying warm in her Patagonia R1 (and Skida hat and neckwarmer) on a snowy day. With the change of seasons comes a change in how we dress while you are training for the Vermont City Marathon in April . A great pro-tip would be to make sure that you keep a synthetic layer or wool and synthetic blend as your next-to-skin layer. This will help to wick moisture from your body, keep you dry, cool, happy, and out there for longer. 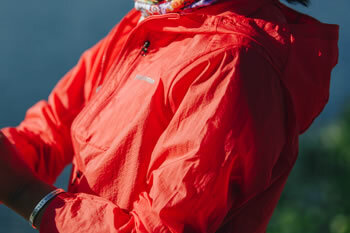 When the rain (or snow) is REALLY coming down, the Patagonia Stretch Rainshadow Jacket keeps you nice and dry. The stretch fabric moves with you and perfect for any activity. To battle the cold and constantly changing weather, I’m a huge fan of Patagonia’s R1 Pullover or Full-Zip Jacket. 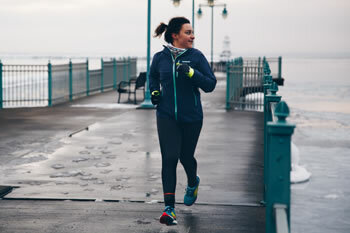 I’ve been running in this mid-layer all season essentially because it’s designed to regulate your temperature working to keep you cool, warm, dry and happy. I tend to run cold, and this has been one of my favorite go-to layers for any sort of adventure from running to hiking to skiing. As well, if you’re looking for some great adventure stories, check out Patagonia’s Done in an R1 (#DoneInAnR1) campaign to see how and where other people have been using their layer. If you're looking for an awesome windbreaker, look no further than Patagonia’s Houdini and Houdini Air Jacket. The main difference between the two is that the Air is a bit more breathable and resistant against light rain. Both great options for a light breathable layer to keep you warm on a dark and stormy day. Patagonia's lightweight Houdini Jacket (last year's color). Photo Credit: Zach Walbridge. North Face’s Motivation Crop is one of the most comfortable leggings that I’ve worn in a long time. It comes in a cropped and full length but what I love about these pants are their high waist, slight compression fit, and 2 big pockets on the side. In the past few weeks of training, I’ve been struggling to find places to store GU, snacks, and water and the pockets on these pants feel like Mary Poppin’s bag…they fit everything! For a loose short, I love Patagonia’s Nine Trail Shorts. They are the perfect length to help against chafing, they’re super light and incredibly breathable. If you do find yourself battling the all-mighty chafe, I would recommend trying out some Body Glide or even Chamois Butter as a preventative approach. I’m new to running in spandex shorts but I’ve recently fallen in love with the Greenlight Short from Brooks Running. They have lots of great tech-features including great storage with a sweat-resistant pocket in their waistband for your phone or wallet, and a spacious pocket on the side of your pants that is incredibly handy for GUs and snacks. On warmer days, spandex shorts have been such a helpful way to stay cool and prevent chafe while running. I’ve also recently tried out Janji’s Race Booty Short. They are lightweight with a great wide-waistband and have minimal movement. Although these do not have any pockets, they are a great option for 3-10 mile runs. I can see these being used constantly this summer especially when the temperatures start to rise. In any weather, any adventure, any situation I always go for Darn Tough Socks. They are a wool/synthetic blend that is moisture wicking and won’t hold odor as much as a synthetic layer. What I love about them is that I don’t feel like I’m wearing a sock. There’s no movement which reduces friction and prevents blisters, and my feet are always cool or warm whether I’m skiing or running. Win-win. As well, they are made locally in Northfield, VT and have a lifetime guarantee which means you can return them to any store that sells Darn Tough socks for an exchange if they are worn out in any way, or you are no longer satisfied with the fit. If that doesn’t make you say win-win-win, then I don’t know what will. Emily running in her Salomon Sonic RA running shoes and staying warm in her Patagonia Stretch Rainshadow Jacket. Photo Credit: Zach Walbridge. Currently, I’m running in the Brooks Adrenaline GTS19 and the Salomon Sonic RA. I have relatively high arches and pronate a bit and find the Brooks Adrenaline GTS 19 to be one of the best shoes that I’ve run in, in a long time. Since everyone has a different foot, every shoe is going to fit differently for them. That being said, I find the Adrenalines to be incredibly supportive and stable without losing the flexibility in the mid-foot. As well, their "Guide Rails" technology is built in to help you find your natural stride versus correcting your foot to run in a specific way. I’m a big fan of rotating shoes throughout the week depending on the distance. My Salomon Sonic RA’s are my go-to for short-medium distances as they are a very different fit. They’re a great option for running on the road while also being able to thrive on mixed terrains from gravel roads to light trail running with their reactive and responsive contra-grip sole. One of my favorite things about these running shoes is having a wider toe box which allows my toes to spread out a bit more as my foot strikes the ground. If you’re looking for a recommendation for a new pair of running shoes, stop by and meet one of our resident shoe experts for some advice! By doing a full shoe fit we can measure and observe your feet to find the most supportive and suitable shoe that will feel like an extension of your body. We also understand that the best way for you to know that a shoe will work for your body is to use them in the moment, hence our 30-day shoe-fit guarantee. We want you to leave happy and confident in your shoes, so the Skirack Run Center guarantees the fit of every running/walking shoe that is fit and video tested by one of our running shoe specialists. If you are not completely satisfied with the fit of your running or walking shoe, you may bring it back within 30 days and put the cost of your purchase towards a different pair of running shoes. Proof of purchase required. Overall, lots of new spring fitness apparel has arrived at Skirack. So, come on down and try on some different layers to see what makes you feel the most comfortable and excited to get out there and run! You are strong + you got this. Click here to learn more about Emily.